This document lists specifications for the PXI-2798 (PXI-2798) relay module. All specifications are subject to change without notice. Visit ni.com/manuals for the most current specifications. The protection provided by the PXI-2798 can be impaired if it is used in a manner not described in this document. 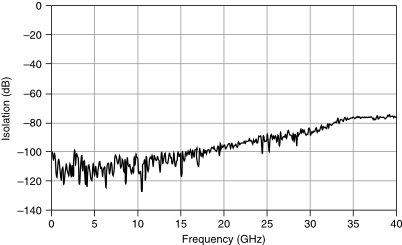 Do not switch active RF signals. As a relay actuates, the channel is momentarily unterminated. 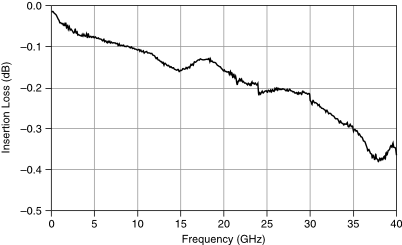 Some RF sources can be damaged by reflections if their outputs are not properly terminated. 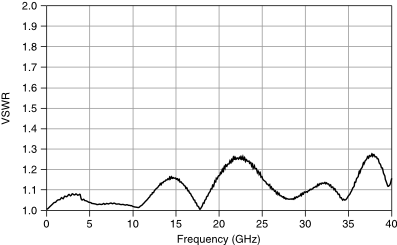 Refer to your RF source documentation for more information. The switching power is limited by the maximum switching current and the maximum voltage. Channel to common switching power must not exceed 18 W.
Refer to the following figure for the typical insertion loss of the PXI-2798. Refer to the following figure for the typical isolation of the PXI-2798. Refer to the following figure for the typical VSWR of the PXI-2798. The PXI-2798 can recognize trigger pulse widths less than 150 ns if you disable digital filtering. Refer to the NI Switches Help at ni.com/manuals for information about disabling digital filtering.